What is machine learning? And what is it good for? We’ll introduce a variety of artistic, musical, and interactive applications in which machine learning can help you create new things. 3. Who is the course for? In this session, we’ll cover the basics of classification, which can be used to make sense of complex data in a meaningful way. We’ll look at two classification algorithms: nearest-neighbor and decision stumps. You’ll be introduced to the Wekinator, a free software tool for using machine learning in real-time applications. We will discuss the fundamentals of regression, which can be used for creating continuous mapping and controls. We’ll explore the use of linear regression, polynomial regression, and neural networks to create new types of interactions. You’ll gain hands-on practice exploring regression algorithms and starting to apply them to build your own systems. 2. What is a regression model? 4. Which regression model is best? In this session, we’ll take a deeper look at what it means to build a good classifier, and we’ll explore some common and powerful classification algorithms, including decision trees, Naive Bayes, AdaBoost, and support vector machines. We’ll also dig deeper into an exploration of how learning algorithms can be integrated into your own work most easily to achieve your desired outcomes. You’ll get a chance to explore these new algorithms and continue to work them into your own projects. 2. What is a "good" classifier? Machine learning makes it easier and more fun to work with all sorts of real-time sources of data, including real-time audio, video, game controllers, sensors, and more! We’ll talk about good strategies for making sense of the data you’ll get from different inputs, and for designing feature extractors that make machine learning easier. We’ll be encouraging students to develop their own feature extractors and share them with each other! In this session, we’ll talk about algorithms that have been specifically designed to help you make sense of changes in data over time. Rebecca will dive into dynamic time warping, and guest lecturer Baptiste Caramiaux will discuss Gesture Variation Follower, an algorithm designed with the arts in mind. You’ll continue to get plenty of opportunities to apply temporal modeling algorithms to real-time data analysis. 13. How does GVF work? Guest lecturer Laetitia Sonami will give a masterclass in which she discusses the way machine learning fits into her own work building new musical instruments, and Rebecca will discuss practical tools, boos, and resources you can access for furthering your work in this field. 4. How is machine learning in the arts different? 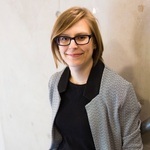 Dr. Rebecca Fiebrink is a Lecturer in Computing at Goldsmiths, University of London. She creates new technologies for digital music and art, and she designs new ways for humans to interact with computers in creative practice. Much of her current research combines techniques from human-computer interaction, machine learning, and signal processing to allow people to apply machine learning more effectively to new problems, such as the design of new digital musical instruments and gestural interfaces for gaming and health. She is also involved in projects developing rich interactive technologies for digital humanities scholarship, and in designing new approaches to integrating the arts into computer science teaching and outreach. Laetitia Sonami is a sound artist and performer. Her sound performances, live-film collaborations and sound installations explore ideas of presence and participation. Sonami’s work combines text, music and “found sound” from the world, in compositions which have been described as “performance novels. Her signature instrument, the Lady’s Glove, is fitted with a vast array of sensors which track the slightest motion of her enigmatic dance: with it Sonami can create performances where her movements can shape the music and in some instances visual environments. The lady’s glove has become a fine instrument which challenges notions of technology and virtuosity.Composer, performer, and sound installation artist Laetitia Sonami was born in France and settled in the United States in 1975 to pursue her interest in the emerging field of electronic music. She studied with Eliane Radigue, Joel Chadabe, Robert Ashley and David Behrman. Sonami lives in Oakland, California and is guest lecturer at the San Francisco Art Institute and the Milton Avery MFA program at Bard College. 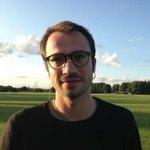 Baptiste Caramiaux is a post-doctoral researcher in the Embodied Audio-Visual Interaction group at Goldsmiths, University of London. Prior to Goldsmiths, he completed his PhD at Ircam Centre Pompidou in Paris, in the Sound Music Movement Interaction group. Baptiste's work focuses on Human Motion in Interactive Systems, in particular for creative applications with Music. His research involves Cognition (link between motor and auditory systems), Bayesian Machine Learning and Interaction Design (interaction techniques, interaction models). Baptiste is interested in new forms of expression based on human motion in interactive contexts, involving sound or visual manipulation in creative applications. His approach is based on Machine Learning techniques and Bayesian inference of the expressive information from motion capture data (3-d systems, physiological data, inertial data, etc.). The methods developed are specifically designed to be used in creative applications, involving exploration and improvisation, such as Music. In parallel, he is also interested in the perception side of the interaction with digital media. Part of this research is to conduct controlled experiments in order to investigate how our gesture can describe how we perceive sounds (a form of embodied sound cognition). Some text-based or visual programming background (e.g., an introduction to ChucK, Processing, Max/MSP, PD, or some other environment) is strongly recommended; without this, students will be much more limited in their ability to experiment with the course material. No prior knowledge of machine learning, mathematics, or other topics is required. Please note: Taking part in a Kadenze course as a Premium Member, does not affirm that the student has been enrolled or accepted for enrollment by Goldsmiths University of London.